Cyxtera has installed a 500 kW Bloom Energy fuel cell. The Bloom Energy Servers will produce nearly 4.4 million kilowatt-hours of electricity each year through a clean electrochemical (non-combustion) process using air and natural gas. By generating power on-site, the fuel cells reduce the facility’s carbon footprint. Cyxtera’s latest corporate social responsibility (CSR) report includes additional details on the use of Bloom Energy fuel cells and insight into the company’s “green” programs, sustainability goals and company initiatives. 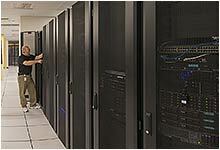 Cyxtera ‘s OC2 data center is an Uptime Institute Tier III Certified Constricted Facility. Cyxtera's OC2 data center has earned the Uptime Institute M&O Stamp of Approval for operational excellence.